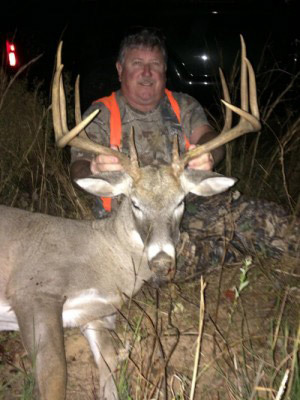 Come deer hunting with us in Barbour and Henry County, AL and enjoy some of the finest whitetail hunting on the eastern edge of Alabama’s famous black belt. Our area is well-known for its production of trophy class bucks. We are located in Eufaula, AL, 50 miles north of Dothan, AL and 85 miles east of Montgomery, AL. Our hunters will enjoy hunting over food plots and game trails. We provide permanent box stands on food plots and active deer crossings, but we encourage hunters to bring their own climbing stands if they wish to do so. We provide transportation to and from the hunting land, and dress your deer after your kill. January is traditionally the time of the rut in Alabama. Our whitetail deer hunting season is open until February 10th. This gives most hunters an extra chance to hunt as most states' hunting seasons have already closed. Our January hunts book quickly, so we are offering 10% off on all whitetail hunts prior to December 20. This is an excellent opportunity for an exciting pre-rut hunt, and a great time to harvest a really nice buck. Book now for the upcoming season. A 50% deposit is required to confirm your hunt, and the balance is due upon arrival. Our belief is smaller groups equals more personal attention to you. We like to limit our groups to 6 to 8 hunters at one time, if possible. In Southeast Alabama, a good bit of our hunting land is hilly country. Place your stand where you can watch trails 1/4 to 1/2 of the way down the hills. Big bucks prefer to move on these side hills, keeping their bodies against the landforms where they don't stand out as much. Although we do whitetail deer hunts throughout the season, the prime opportunity to bag a mature buck will happen during the rut, or their breeding season. In the rut, they will move all day to find a mate. Otherwise, you will most likely see deer in the early morning or late evening. A strong coldfront is prime for deer movement. Make sure to dress accordingly and bring extra layers so your long sit will not be so uncomfortable. Failure to dress warmly may cause you to lose your trophy buck. Patience is key. Though grunt tubes and rattling horns are useful tools, the best method is to wait and stay alert. We have identified the best active scrape lines where your trophy buck will appear. Seeing your first mature buck in the hunt can be exciting. Always make sure that you can clearly see and identify your target before you fire at rustling brush.